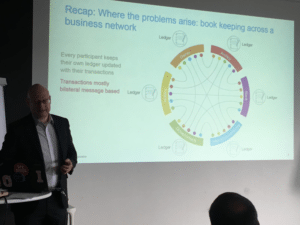 Hyperledger, along with Sapient Consulting and Altoros organized a Meetup in Frankfurt am Main in Germany on May 11 that focused on the blockchain technology and its application across many industries. Hyperledger is an open source collaborative effort created to advance cross-industry blockchain technologies. It is a global collaboration, hosted by The Linux Foundation, including leaders in finance, banking, Internet of Things, supply chains, manufacturing and Technology. Hyperledger Meetup groups make up a key part of the Hyperledger ecosystem. Participation in a Hyperledger Meetup group is open to anyone–employees of a Hyperledger member company, Hyperledger contributors and developers, and people just passionate about blockchain technology. The meetup started with a welcome address by the event host, Mr. Mithun Sridharan a manager at Sapient Consulting. 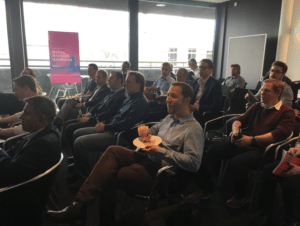 This was followed by a 2-part presentation by Thomas Hartmann, expert consultant at IBM Global Business Services, focusing on Financial Services customers. During the first part of the presentation, Thomas provided a broad overview of blockchain technology and presented two industry use cases demonstrating the benefits of blockchain in tackling complex foreign exchange netting and trade finance challenges. The second part of the presentation covered Hyperledger Fabric, a blockchain framework and one of the Hyperledger projects hosted by The Linux Foundation. The Hyperledger Fabric presentation can be found here. Following a short break, Bertalan Vecsei, Hyperledger Blockchain Solution Architect at Deutsche Bahn Energie and Dr. Michael Kuperberg, Senior Software Architect at Deutsche Bahn AG delivered a joint presentation on the solution architecture design and technology stack aspects of a Hyperledger implementation in their organization. The presenters shared several challenges, solutions and best practices based on their experiences using Hyperledger in developing a marketplace concept in their organization. 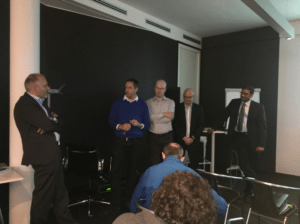 The presentations were followed by a panel discussion by the event host, presenters and Klaus Schilling, Director of Business Consulting at Sapient Global Markets. The discussions highlighted the importance of ‘holistic thinking’, the importance of articulating customer value and service design thinking aspects while developing blockchain-based solutions. 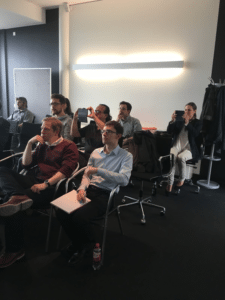 The audience actively engaged and participated during this meetup, interleaving their questions, sharing their insights and sharing their experiences and best practices with Hyperledger throughout the presentations and panel discussions. Please follow the Hyperledger Frankfurt Meetup page to learn more about the next event in Frankfurt. For inquiries regarding this event, please get in touch with the local chapter lead, Mithun Sridharan via email (msridharan2@sapient.com). For Hyperledger related events in Europe, you can contact Marta Piekarska, Director of Ecosystem at Hyperledger via email at mpiekarska@linuxfoundation.org. If you don’t see a Hyperledger Meetup local to you, please consider starting your own. You can also plug into the Hyperledger community at github, Rocket.Chat the wiki or our mailing list. Be sure to follow Hyperledger on Twitter or email us with any questions: info@hyperledger.org.